The ship at sea in the Hawaii area. The ship was launched in 2006 and has had great reviews. There is distinctive Hawaiian loa livery. The livery represents the welcoming Hawaiian flower garlands given to visitors. The inside decor is colourful and sumptuous. 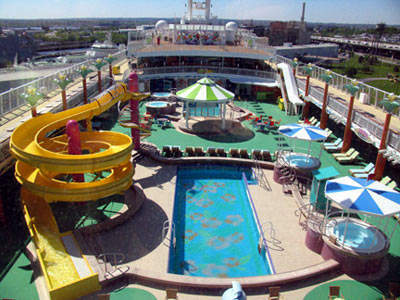 The Waikiki leisure pool is one of the ship’s central attractions for the children aboard this very child-friendly ship. 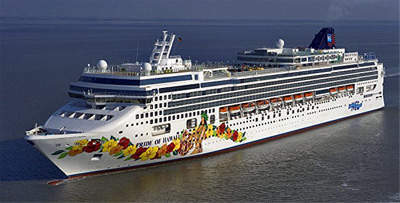 The Pride of Hawaii was launched in May 2006 and is the third and final Hawaii-based US registered ship for Norwegian Cruise Lines America (NCL). 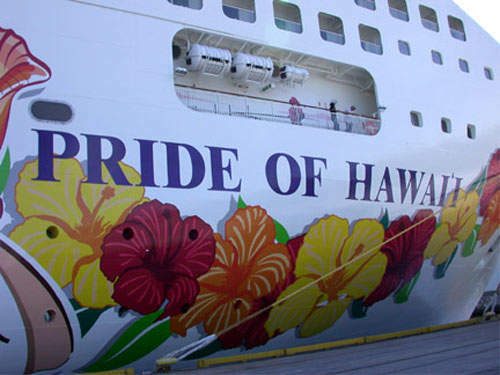 The Pride of Hawaii was inaugurated in May 2006 at the San Pedro Pier in Los Angeles, California, US. The Pride of Hawaii’s sister ships are the Pride of Aloha and the Pride of America, all of which sail under the US flag. The three ships operate in the Hawaii cruise market and have to be under the US flag because sailing under the US flag eliminates the problem of the Jones Act that forces ships flying other nation’s flags to break up US itineraries with a stop at a foreign port. Previously this had made the Hawaiian Islands problematic for cruising, requiring much longer itineraries. However, so as to receive permission to fly the American flag these ships are required to have a 90% US crew and this is another problem as sufficiently trained staff are just not available. Pride of Hawaii stock itineraries are seven-day cruises in the Hawaiian Islands, roundtrip from Honolulu starting every Monday. The ship has a gross tonnage of 93,000t and is of Panamax dimensions. The length is 965ft and the beam is 106ft with a 27ft draft. The vessel has a maximum speed of 25 knots and a cruising speed of just over 18 knots. The passenger capacity of the ship is 2,224 with service being provided by 1,100 crew members. The ship’s cabins and amenities are available over 12 decks (total number of decks is 15) and there are a total of 1,188 cabins (783 outside and balcony cabins, 405 inside cabins and 27 disabled access cabins. The Panamax-class ship was built at the Meyer Werft shipyards in Germany and cost over $500m to construct and outfit. The cabin/stateroom level varies onboard from the most luxurious owner’s suites of which there are five on decks 9 and 10 to the lowliest inside stateroom. The Garden Villas are 5,750ft² villas that come complete with a spacious living room, dining room, private sundeck and three bedrooms, each with a private luxury bathroom. One bedroom also features a full bath with whirlpool tub and separate shower, with a full butler and concierge service. Only slightly further down the scale, Courtyard Villas are a brand-new style of accommodations for NCL. They feature access to an exclusive concierge lounge and private courtyard area with pool, hot tub and sundeck, where coffee and pastries are served automatically for breakfast and a full concierge service is always available. The ocean view with balcony suite incorporates two lower beds, sitting area and a floor-to-ceiling glass door that opens to a private balcony. The cabins have rich cherry wood finishing, safes, refrigerators, tea and coffee makers, internet connection and a full bathroom unit. The ocean view stateroom is similar with just a picture window or porthole. Finally the inside stateroom has a sitting area and two beds that convert to a queen size bed and there is also a TV and refrigerator. 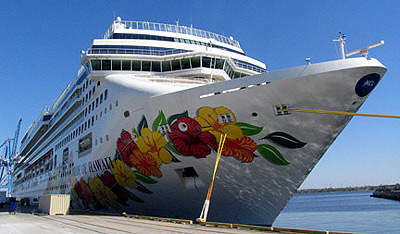 The Pride of Hawaii has a distinctive Hawaiian decor and motif, which is indicative of the year-round cruise itinerary in the Hawaiian Islands. 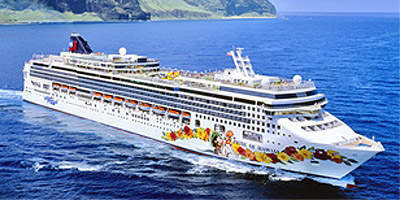 The ship is marketed to families and indeed anyone wanting to cruise the Hawaiian Islands for a week. The Pride of Hawaii features the NCL concept of ‘freestyle dining’, which means that passengers can choose to eat at any of the ten dining venues at the time they wish. The ship has a wide variety of cuisines including Asian, steakhouse, Italian, and tapas. The Stardust Theatre, a Venetian art nouveau styled opera house, seats 1,037 and spans three decks. The ship usually stages colourful Las Vegas-style shows from the Jean Ann Ryan Company. The Stardust Theatre is also used for cabaret entertainment. The El Dorado Spa and Salon is operated by Hawaii-based Mandara Spa, which is owned by Steiner Leisure of London. The spa is at the stern and has large picture windows on three sides. The spa features an indoor lap pool, hydrotherapy pool, aromatic room, mud treatment room, 15 massage/therapy rooms, couples massage rooms and beauty salon. The fitness centre is located at the top of the glass-domed atrium lobby, and is equipped with the latest equipment. In addition, yoga, kickboxing and body cycling classes are available for a fee. The Atrium is in the middle of the ship and contains the main reception, the Shore Excursion desk, the Port of Call shop, which features collectibles and memorabilia, and the Java Cafe. There are ten restaurants onboard, including: Papas restaurant, which is in the style of a village Trattoria or traditional Italian farmhouse kitchen; the Alizar restaurant is a modern contemporary all-purpose dining room with Mark Rothko artwork and decorative walls with subtly changing colours; and the Aloha Nui Lanai restaurant offers a family-friendly menu of omelettes, pasta, soups, salads and ethnic specialities, served outside. Other restaurants and bars include the Spinnaker Bar & Lounge, the oriental themed Jasmine restaurant (consists of main restaurant, sushi bar and Teppenyaki) and the French cuisine Le Bistro restaurant, Cagney’s Steak House, Grand Pacific Main restaurant, Paniolo Tapas Bar & restaurant (Tex Mex style) and Blue Lagoon (24 hour service). The Kid’s Cafe is located in a corner of the Aloha Nui Cafe with miniature tables and chairs, and child-friendly foods such as fish fingers and chicken nuggets in fun animal shapes. The ship has seven meeting rooms plus the Diamond Head Auditorium, a multi-level, circular room with a state-of-the-art audiovisual system offering multiple screens. The auditorium can also be split into two rooms. The conference facilities are the largest offered on any cruise ship and include a dedicated meeting deck that spans more than 9,300ft². In addition, the Internet Centre offers state-of-the-art computer and internet facilities, plus a computer lecture and training area. 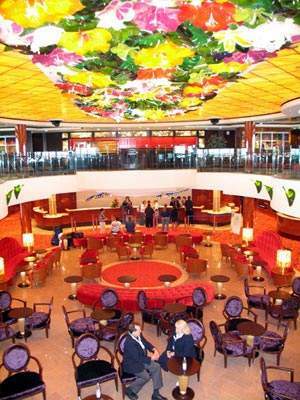 The ship also houses 12 bars and lounges for drinks and relaxation. Aft on Deck 7 is the Galleria Boutique, a large department store-style shop. Also on Deck 7 is the Golf Pro Shop for golf equipment and onboard clinics with local golf pros in the two practice nets. The SS United States Library features ample shelves of fiction and non-fiction titles in multiple languages. Near to this is the Lifestyles room for educational courses and the wedding chapel. NCL have launched an electronic system launched on the ship to cut down on queues and waiting times in restaurants. Monitors throughout the ship reveal how busy each restaurant is with a bar that ranges from green (no wait) to red (crowded, have to wait). The monitor also lets cruisers know how long the wait is for a table for two and where large parties are being accepted. To find your way around the ship, the carpets have dolphins on. If you follow the direction of the dolphins, you head forward; if you need to go aft walk against the flow of dolphins.